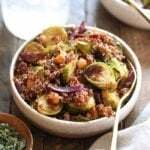 This Golden Roasted Cauliflower and Quinoa Salad is a healthy, satisfying, and delicious salad that everyone in your family will love. 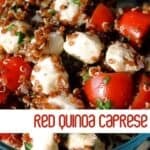 It is great for a quick meal-prep lunch or a light quinoa salad for dinner. You can’t beat the savory tahini dressing with sweet raisins for the perfect sweet and savory combination! I have a secret that I am going to share with all of you right now. If you’ve ever cooked with turmeric, you’re really going to thank me. 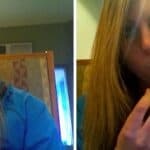 Well, technically you will have our friend Sara from This Fem to thank because she shared this secret with us. We all know that if you use a wooden utensil, a white utensil, or really any kitchen tool when working with turmeric, it will most likely immediately be dyed yellow or orange. Dangit, right? Well, Sara saved our lives and told us (HERE’S THE SECRET)—> if you take whatever tool is dyed yellow and set it out in the sun for a couple days the sun will take that turmeric dye out of your kitchen tool. PRAISE BE. We tested this theory out with a grey whisk that Lee received as a gift from Norway. Guess what, you guys. IT WORKED. The grey whisk that was once dyed with deep yellow was gray again! We were ecstatic. Since that glorious day, we have also tested the theory on a spatula and it also worked. We have yet to try it on a piece of clothing, so if you try it, let us know! Lastly, we are always looking for different ways to eliminate turmeric dye from unwanted surfaces, so let us know if you have an alternative method. 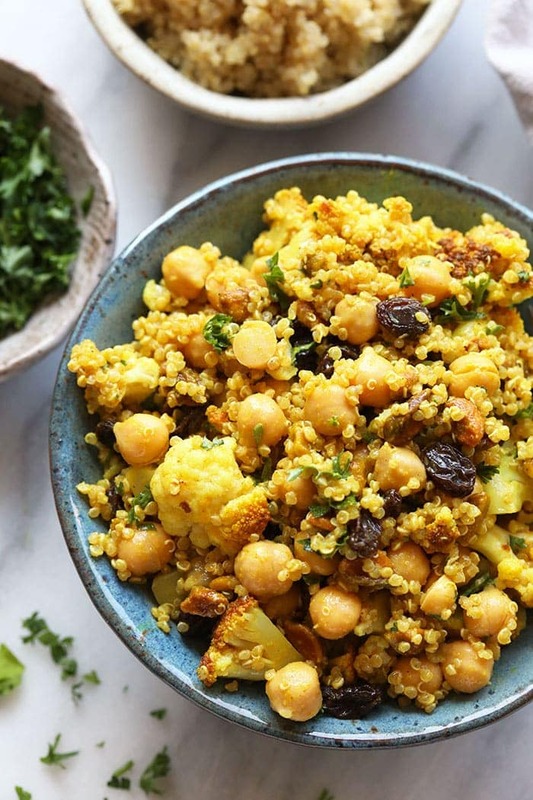 One thing we don’t mind turmeric being in is this golden roasted cauliflower and quinoa salad. 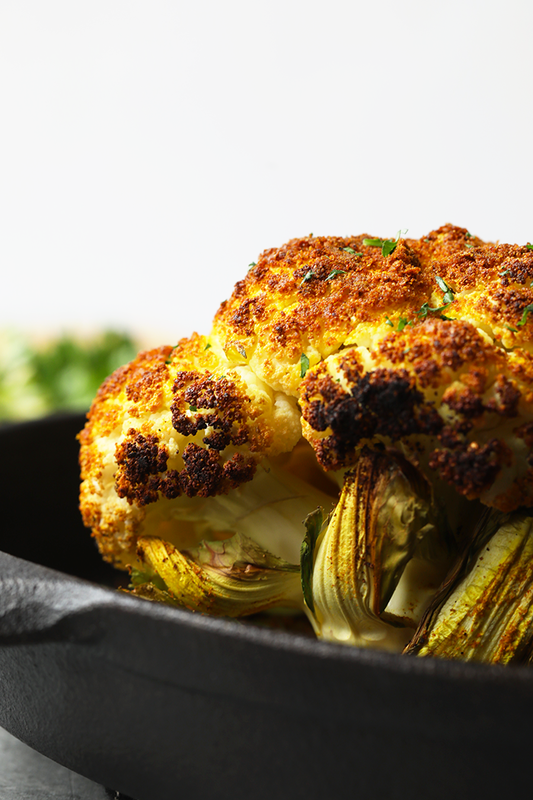 A couple weeks ago, we posted this Golden Roasted Cauliflower with Turmeric recipe. We were absolutely obsessed with the roasted cauliflower as an appetizer dipped in tahini because tahini rules the world. We tested that recipe a couple times and had a eureka moment—> this golden roasted cauliflower would be delicious in a SALAD. I have recently been obsessed with chopped salads where everything is the same size. Why do you ask? Because then every bite is absolutely perfect, of course! 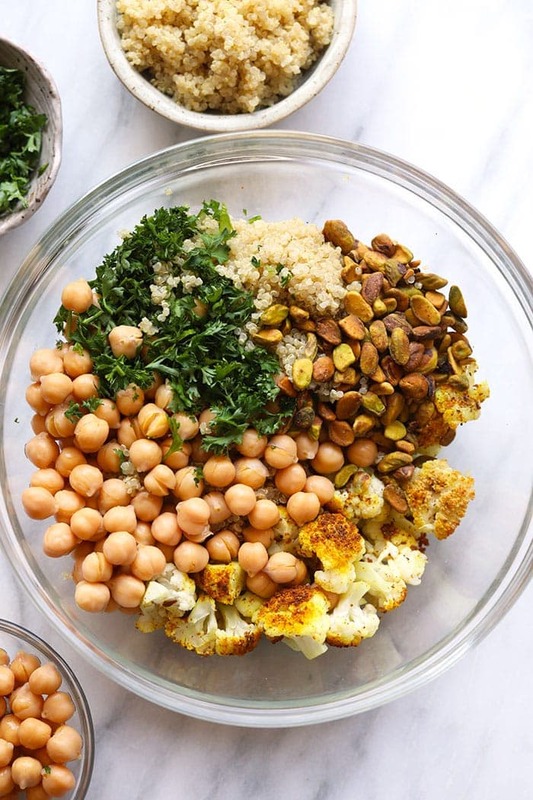 We wanted this roasted cauliflower salad to be filling and delicious, but also wanted it to be extra nutritious (see what I did there?). 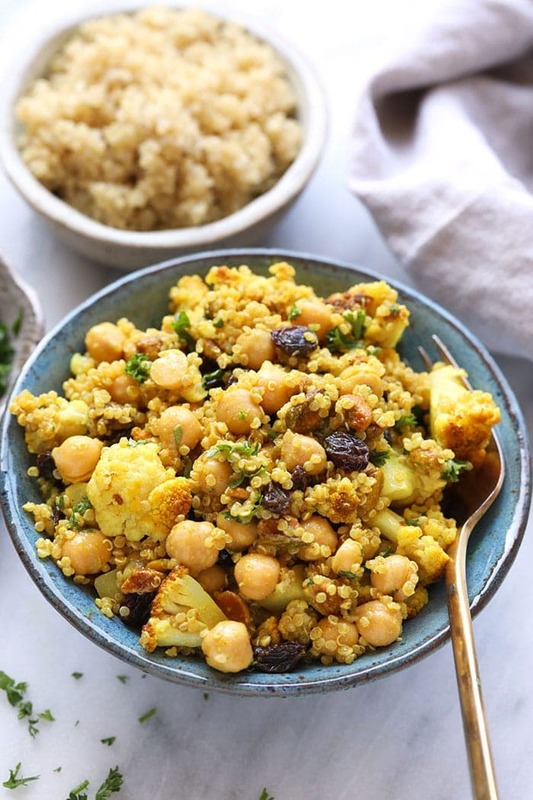 This healthy roasted cauliflower and quinoa salad with turmeric is a great addition to any meal-prep lunch or dinner. Also, if you’re dairy-free this salad is a great option. If you love cheese, definitely add the feta. It adds a whole other element to the salad. 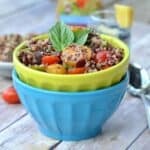 You will find team fit foodie eating this salad about once a week right now, it has become a staple! It would be a great salad for a Mother’s Day Brunch or for a potluck for Memorial Day. No matter what you make this golden roasted cauliflower and quinoa salad for, you won’t be disappointed. 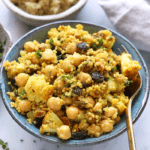 This Roasted Cauliflower and Quinoa Salad with Turmeric is a healthy, satisfying, and delicious salad that everyone in your family will love. 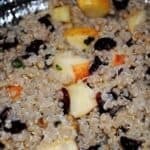 It is great for a quick meal-prep lunch or a light quinoa salad for dinner. You can’t beat the savory tahini dressing with sweet raisins for the perfect sweet and savory combination! Prepare the dressing by adding all ingredients into a mason jar. Close the jar tight and shake until dressing is mixed well. Next, prepare roasted golden cauliflower by following the directions HERE. Let the roasted cauliflower cool for 15 minutes before chopping into bite-sized pieces. Then, add all of the ingredients for the salad into a large bowl. Mix well. Pour dressing over salad ingredients and toss until everything is coated in dressing. *Nutrition information does not include feta.